Its a pinkish green when its outside, but i have seen it in offices where it is bright green. I guess sun exposure has a lot to do with color. It bloomed in the spring. Hi Emma - I'm thinking that this plant belongs to a group of plants known as the Rat Tail Cactus and going by the botanical name of Aporocactus flagelliformis. They form a group of trailing stems, eventually reaching 40-50 cm long (around 14-20") and sometimes longer, depending on the species or hybrid. They usually won't bloom until they're thoroughly root bound, and as you say the blooms are a vivid orange, but they can also be in shades of purple, pink and a violet red. Each bloom only lasts a short time, but new ones open over a span of about two weeks. Second year growth produces the most flowers. You're absolutely correct that light plays a big part in their colouring, but luckily, they are quite adaptable to most conditions except extreme wet. Their natural habitat is on cliffs, rocky ledges and in trees, so they require excellent drainage. Thanks Jacki, now I know not to leave it ouside during the winter. My expertise runs more to succulents! For your climate, if you don't get frost, ever, then you might want to risk leaving this guy outside, but if there is any possibility of the temperatures dipping below freezing, I wouldn't guarantee that it won't get damaged. Not worth the risk, but if you do keep it indoors, make sure it has as bright light as you can manage, and let it go semi-dormant for the winter. This is what makes them bloom so well - the water deprivation, then in the spring when you start to water again, it will prompt the blooms to form. I didnt know that the drought and dormant period triggers the bloom in the spring. Good to know. Thanks. I think this little cactus is actually a 'peanut cactus' [Chamaecereus sylvestri]. They don't seem to like a lot of direct sun, and like a very dry, cool winter rest. I have several of them, and currently having trouble getting the mealy bugs cleaned off them. Any advice for that? Thanks Jacki! that is what i have. thanks! Hi Amy, thanks for the correct name - and a botanical one too! They certainly are a cute little plant, and those blooms will rip your eyeballs out, they're so bright! As for mealy bugs, I have had problems with these too, some years more than others, but one thing I do know is that even when you think you've won, stay vigilant, as with the slightest bit of neglect on your part, they're back. For treatment, in all cases, multiple sprays are essential - I do mine around once or twice a week if any of the plants in my collection show signs. Sometimes they've already moved on to a new plant, which doesn't become evident for a while, so if you see them on any plant, spray the rest too. My favorite spray is simply Safers insecticidal soap, made to the directions on the bottle, with a dash of cooking oil in it. Shake the concoction well, as it will try and separate. Coat all surfaces of the plant, especially in the axils of the leaves, or in the case of the cactus, where the stems emerge from the soil. I'm suspecting that the reason they're so hard to get rid of is because they hide below the surface of the soil. For really bad infestations, sadly, sometimes the only treatment to prevent them spreading is to cull those plants that are the worst off. Sometimes you can retrieve a leaf or tiny part that you may be able to propagate so you don't lose the plant altogether. See the page on Succulent Plant Pests too. Amy, do you have a picture of your plant with the bugs. I think that is what mine has. I thought maybe it didnt like relocation. Note from Drought Smart Plants: Amy, post a picture on this page: Ask the Horticulturist, if you have one. 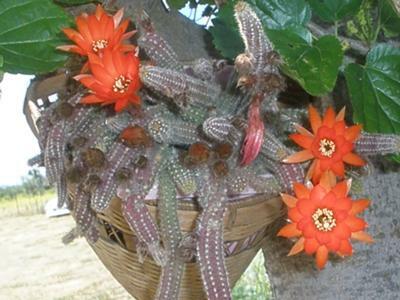 My cactus which is the same name as the one ur discribing . Mine is 3 yrs old as I was told by the giving person. It has bloomed around 10 times. I half the cactus with a friend. Now my cactus nor her cactus does anything. The arms are gooy and purple.. plz help me I so want this beautiful cactus..
Missy, if the arms of your cactus are gooey and purple, it's game over. The plant is dead, and there really isn't any hope for it. Try again with a new plant, and don't water it too much. Well no now that I'm able to take a good look at my cactus the inside of the arms are orange. The outside of them look the same way as wen I got it. It all looks the same way as wen I got it. I jus halted it cause the cactus didn't have anymore room to grow. I had to put it in a bigger pot so the roots can have room.. so wat do I do now?? Missy, without pictures I don't know what to suggest - your question isn't clear. Ask on the Ask the Horticulturist page, and post some pictures and CLEAR explanation of what you need to know. Sounds like time to toss the plant and start over again! All you need is a little section of the plant that's green looking. Put it on the surface of the dirt and water once a week. For an "easy" plant it's the one I've had the most trouble with, but one of my favorites when it blooms. Good luck!